Bio-25 LR is an innovative formula containing 8 different strains of unique probiotic bacteria and over 25 billion active bacteria in each capsule. Therapeutic dosage of just one capsule a day. Contains 8 different strains of probiotic bacteria mostly frequently used in probiotic research. Contains over 25 billion bacteria in each capsule, more than any other probiotic formula. Bio-25 LR formula is designed to alleviate various digestive disorders and mainly those who suffer from inflammatory bowel diseases (Crohn's Disease, Colitis), and from Irritable Bowel Syndrome (IBS). Ingesting Bio-25 LR on a daily basis and for a prolonged period will alleviate digestive disorders such as: diarrhea, constipation, gas, swollenness, and stomach aches, and will also bolster the immune system and alleviate different allergic conditions. There are numerous strains of probiotic bacteria. 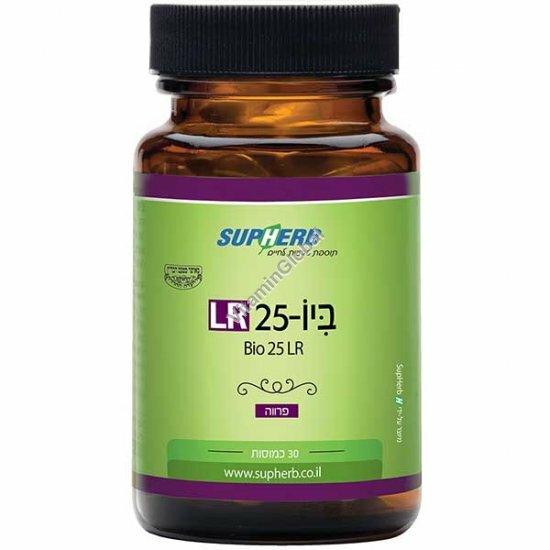 Bio-25 LR contains 8 of the most frequently studied strains, with proven capacity for growth in the intestine. L. acidophilus, L. Reuteri, L. Paracasei, L. Rhamnosus, L., L. Casei, L. Plantarum, B. Lacts, L. Salvarius. Instructions for use: one capsule a day, with a meal. Recommended to combine with: Turmeric extract with piperine, Aloe vera drink. Available in packages of 30 vegetable capsules.